I am certainly not the best skier in the world. Whilst I am comfortable in getting down most runs in some sort of fashion, as soon as I see ice, I worry. The same used to be true for me as a SCUBA diver, I was reasonably comfortable in most circumstances, however as soon as there was a whisper of a current, I would worry. Some of the best dives are in locations that are subject to strong currents. With currents, come food in the form of plankton. In turn, the food attracts small fish, which attract larger predatory fish and animals and so the cycle continues. This creates a diverse ecology. Rather than getting worried about currents, read on. The following tips and tricks will ensure you get the most out of your diving by not missing out on some spectacular current prone dives and, most importantly, stay safe. Learn to read the conditions before you even dip your toe in the water. An experienced instructor, dive guide or boat hand will be able to read currents by watching the surface patterns and the position of any marker buoys on the surface. Ask them questions and try and learn from their observations. If you are boat diving, it is worth dropping in a line with a float attached, known as a “mermaid line” to check where the current is going. It is recommended that you begin your dive heading into the current, assuming it is not too strong. The idea here is that you will use your energy heading into the current at the start of your dive when you have plenty energy and plenty of air. At your turnaround point, you will then be able to drift back with the current. Bear in mind that you may need to alter your dive plan in order to accommodate currents. Flexibility in dive planning, subject to conditions, is key here. I would always recommend that you descend using a line such as a shot line or anchor chain. If a line is not available, ensure you have a visual reference for your descent such as a wall, which can also provide protection from a current. Free descents, especially in currents are not recommended as there is a risk of being carried away from your planned dive before you have even started. If you do get carried away in a current and have no visual reference, ascend and signal to the boat for a pick up (a fist vertically held in the air), assuming you are unable to make it back. Do not continue your dive into blue water, this is when divers can get into trouble and can end up taking part in an unplanned search and rescue event. 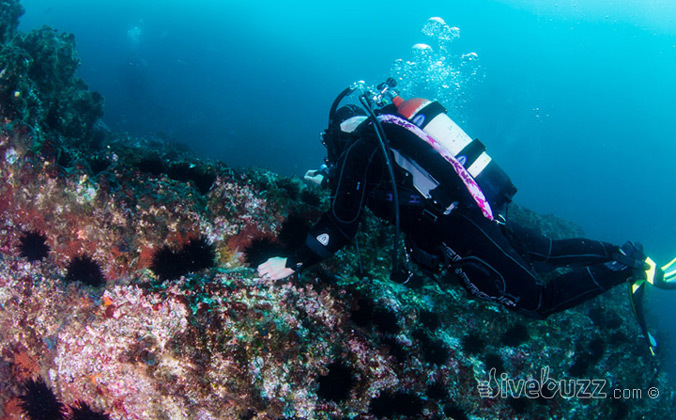 The surface can be a very unforgiving place for divers when conditions are not optimal. In fact, most dive accidents actually happen on the surface. Often, currents will be milder on the bottom so I would suggest that you head straight down to the bottom with your buddy rather than wait around on the surface. If you are experienced and comfortable, a negative entry, where you enter the water with no air in your buoyancy compensator and head straight down is a good option in rough conditions. As part of your dive planning, consider arranging to meet the group at the bottom. There is nothing big and clever about pushing yourself when conditions are not optimal. Safety is, as always, your key concern. With this in mind, know when to call a dive. No one will think any the less of you for not diving if you are not comfortable or for aborting a dive where conditions are adverse. It is better to be safe than sorry and there will always be another day. Watch the fish – they are the experts! Goldfish may have a 3 second memory, but rest assured, you can learn a lot from fish by simply watching them. In currents, and particularly in surge, they do not swim constantly and battle the current. Instead, you’ll witness them sheltering, using the protection of the reef. You will also notice them using surge to their advantage by timing their swimming in sync with the forward surge. You can mimic this by even holding on to the bottom to avoid being dragged backwards in surge and then swimming as soon as the return forward surge comes to maximise your propulsion. You can also learn a lot by watching other divers. Worth tucking in behind an experienced dive guide and copying their techniques. By staying low you gain protection from the current and can hang on, if required. As previously mentioned, currents tend to be weaker on the bottom, where you can gain protection from the seascape. In order to use this to your advantage, stay low and close to the bottom or even a wall to avoid the full power of the current. I have at times literally dragged myself along the bottom with my hands in a current rather than fatiguing myself by constant finning. Be aware of your environment, however, picking rocks to grab hold of is fine but brittle stag horn coral is not! Also watch out for other dangers, such as stonefish disguised as a rock. For this reason, it is a good habit to ‘waft’ the water before placing your hand down, this will generally cause any potential hazards to move and allow you to see it. Pulling yourself along should be a last resort. In a current, a smaller but faster fin kick may prove to be more efficient rather than big, unstreamlined kicks. If you are used to the “frog-kick” you’ll have to adopt to change to a more standard, and more powerful, “flutter” kick. Fin choice may also be a consideration. Different fins work in different ways and some certainly have more grunt in currents than others, so worth doing your research here. Whilst often tested and marketed as one of the most efficient types of fins, split fins in my experience operate less effectively in currents than a larger powerful blade fin. Being out of breath on a dive is not a nice feeling. An out of breath diver can quickly turn into a panicked diver when the feeling of not being able to take in enough air occurs. If you are feeling tired, fatigued or out of breath, simply stop and take a break. Grab a piece of rock or dead coral, hold on, rest, relax and get your breath back. You may want to consider wearing gloves to protect your hands, I personally am not an advocate here. If you do wear gloves, please be mindful of the look, don’t touch policy and be extremely careful not to damage the environment. A reef hook or pointer / muck stick can also be used to hang on and, when used carefully, will not cause environmental damage. Again, I am loathed to recommend as I have witnessed instances where these devices were not used correctly and have caused damage. You need to make sure that you demonstrate good “trim” by being nice and streamlined in the water. A streamlined diver is horizontal and therefore better able to move through the water with less resistance. Proper weighting is key to getting streamlined. Also think about streamlining your equipment as much as possible. Dangling gauges, reels, torches, cameras, alternate air sources and the like will all cause drag, so get them secured away and streamlined. Snorkels in currents can also be annoying as they tend to knock against your face or create drag, so consider popping your snorkel in your pocket instead. Divers carrying big camera rigs will also struggle in currents due to increased drag, so think twice about loading yourself up with such gear when there is a strong current. Ensure you ascend using a line or a natural visual reference such as a wall. If boat diving, ideally you should try and make it back to the ascent/descent line to complete your dive and safety stop if required. Lines are excellent to hang off whilst completing your stop in a current. If you end up away from the line or visual reference, take care. Free ascents can be hazardous and with no visual reference it is easier to exceed a safe ascent rate, so keep a close eye on your computer or depth gauge. I would recommend deploying a Delayed Surface Marker Buoy (DSMB) on your safety stop if you are away from the ascent line. The DSMB will alert boat crew or land based non-diving support to your location and also signal to any passing boat traffic that a dive group is below. Whilst recommended on all dives, if your computer is not mandating a safety stop for you, consider your options. During a 3 minute stop in mid-water with no reference and in a current, you can travel a significant way from the boat or exit point so it is worth weighing up your options. Of course, if your dive computer requires you to complete a stop, complete a stop. Read more on safety tips if you get lost here. 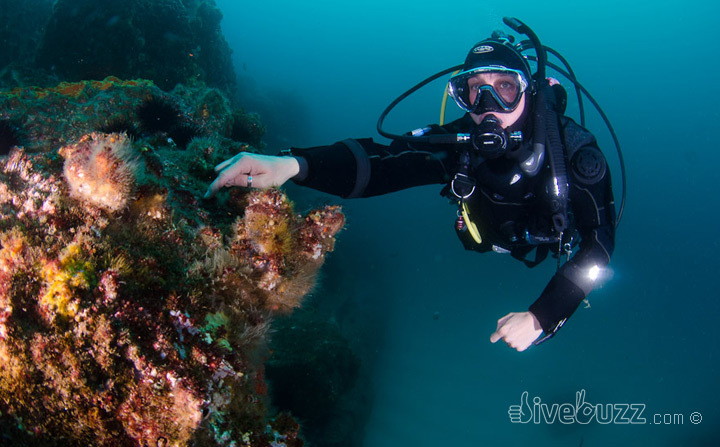 If you are not experienced with diving in a current, make sure you go with an experienced local dive guide or buddy who can read the conditions and advise you accordingly. Most of all, stay safe and enjoy your diving. If visibility is poor and you become disoriented, watching which way the bubbles go will help you estimate the current, as well as being able to tell up for down.